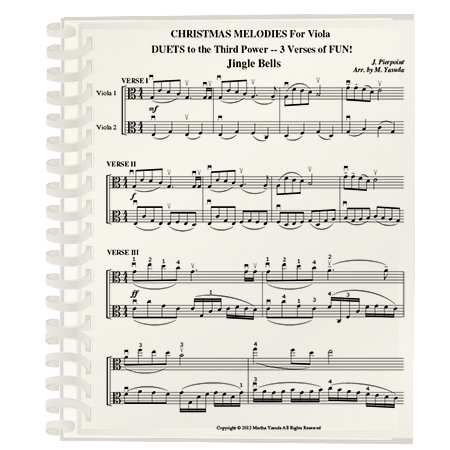 My Duets3 version of Christmas Melodies for VIOLA is an excellent resource for planning studio Christmas programs, playing at holiday parties, or simply gaining sight-reading experience while playing fun and familiar music. The meaning of “cubed” or “to the 3rd power” is that there are three levels of difficulty for the second violist: easy, medium and hard. But what really makes this Duets3 Volume unique is that the first viola part is very simple and remains the same in verses 1 and 2, going up an octave on many of the 3rd verses. This feature, combined with the three different gradings for the second violist yields two very important implications about this Volume. First, ALL levels of students are appropriately challenged, from the beginner to the most advanced. And second, related to this first point, you can get a tremendous amount of mileage from this material. In particular, if you start your beginner students with this Volume, you can continue using it in a challenging manner for many years to come, without them becoming bored! This will become most evident when you view the Sample PDFs or listen to the Sample MP3s below. 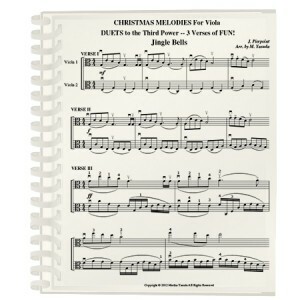 Please click on Christmas Carols to see a complete Song List.